Biography: Daniel became a Christian in 1976, and started working with youth in 1978, becoming a full time pastor within five years. 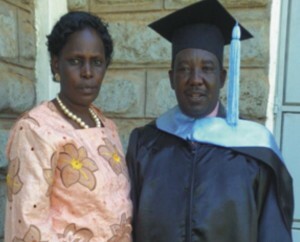 Living Faith Outreach Centre began in 1997 in Eldoret with just Daniel, Jane and their family. As they started preaching and holding open air meetings in the villages, the church began growing, and over the years they have planted more than 36 churches in different locations in the country. Each church has pastors and lay leaders serving the local church. Daniel says, "Developing effective lives for the kingdom of God, having people with Christ characters, and equipping the saints for the work of ministry is what I have been doing and I am still doing to date. My passion is to see souls come to the knowledge of our Lord and developing those lives and releasing them to do the work of the ministry." Daniel and Jane believe that God uses ordinary people to do extraordinary things. Feeling that the ministry is an oasis of love, a healing center for spirit, soul and body, Daniel and Jane have many objectives including providing spiritual and practical guidance to the community to help the members become fully functioning human beings. They have established centers and workshops for training orphans and young people, and engage in income generating activities to supplement the upkeep and maintenance of the centers. HIV/AIDS counseling, community health programs and feeding programs are also included in the many outreaches of the ministry. Strengths: Daniel serves the community as an apostle, with gifts of pastoring and teaching. Family: Daniel and Jane have an adult son, Simon.